Heavily-hyped prospects often have carefully-timed debuts, and Baseball America's list of the game's top 100 prospects features those currently generating the most buzz. 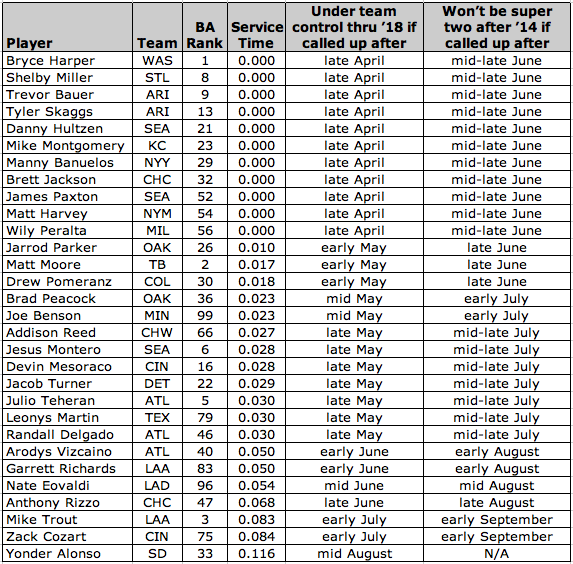 Of the 100 players on the list, 31 project to arrive in the Major Leagues in 2012. The chart below presents two key dates for each prospect who might make an impact this coming season. First, there's the approximate date on which the team can call the player up while keeping him under control for an extra year — through 2018. Next, there's the approximate date on which the team can call the player up without setting him up for super two status and a fourth trip through arbitration. I've estimated conservatively when it comes to projecting super twos, since more players than before will qualify under the new CBA. Yu Darvish and Yoenis Cespedes probably won’t be subject to service time manipulations given their distinctive contract statuses. The same likely applies to Matt Moore, who signed a long-term deal with the Rays, but I've included him on this list all the same. Keep in mind that many players not listed could also be subject to service time management by teams. If Bryce Harper hits the FA market after ’17… he’ll just be turning 25. If he dominates like he’s supposed to, he’ll end up with the most ridiculous contract ever. That’s why if I’m the Nationals I wait as long as I have to to delay that. or get him to sign one of those evan longoria/matt moore deals. Norberto’s right on the money. If you are the Nats and you want to have him in his prime when he’s 27 or so, why would you bring him up now? As Tom says, he’s not going to sign an extension with Boras as his agent. Wait 2 or 3 years to call him up and get to keep him through his presumed prime age 27-28 seasons. That is an excellent idea in this way. The Nats could have their cake and eat it too. Boras has been playing games with teams for years. The Nats should forsce Boras’ hand by starting him at double A this year. Tell Boras they would be fine giving him three plus more years in the minors without any big league service time until May 2015 at which point Harper would be 22. This would allow the Nats to have him in 2015, 2016, 2017 at what ever price they want. Harper would be arbitration eligible in his 25-28 seasons not allowing him to hit free angency until he is 29 year old season. He already has 3 years remaining on his rookie deal at 2 million a year. Force Boras’ hand and the keep Harper locked up through the next decade or let him Put up mostrous numbers in triple A for the next couple years. If I were the Nationals I would leave him in tripple A this year and call him up in May of next year, afterall when was the last time a 19 year old position player made the team out of camp and really made a mark. Another year or two developing would be in the best interests of both parties. That is phenomenal idea except for the fact that Nationals park would deteriorate because they would be constantly trumped by the Braves and the Mets if they didn’t.The Nationals felt that with the 2nd past offseason to get werth and the last offseason move to acquire Gonzalez was enough to contend also considering that Strasburg was coming back from season ending surgery. either that or this could end up being a Miguel Cabrera 2.I don’t think Washington would sell Harper’s soul for 6 lousy prospects from another team. Simply put, you have an above average prospect such as Harper, Trout or Strasburg. Who cares about contact timing if you have a player who will not only cost less in the here and now, but someone you drafted. That’s why certain teams have been losing for a long time. They feel taking a flyer on a free agent for a one year deal and paying them is better than playing their stud and having to worry about Super Two. I don’t get why there is even talk about this. If you have a player who needs more time in the minors, great! But if you have a stud, play him. Because they want to retain the stud they developed a while longer. Now we are seeing teams extend young player and I think thats great but its an exception not the norm. GREAT IDEA! Lets just keep him in the minors till he is out of options so when he is called up he will be in his prime years. Age 22-27 is much better than 19-24. After all you want to max out his talent so why not wait so you get more bang for your buck right? Who cares if he is hitting 40+ HR’s each year in AAA we want to save money!!! Nolan Arenado (BA Rank 42) should be on this list and with 0.000 service time he would be part of that top group. Yes I saw that Ben said many others could be considered but it seemed this list dealt with the players in the BA top 100 who had a chance to play this season. Arenado may break ST as the Rockies 3b. Well right now, if you google Nolan Arenado it says, Nolan Arenado will not by part of September call-ups. Oversight? Devin Mesoraco is listed as SD, when it should be Reds! Probably a simple mixup with Grandal. This is 6 months old. I don’t even remember what was going on in the slightest. I’m confused…do the Rays gain anything by holding Matt Moore down in the minors this year, given he signed a contract already? If not, why is he on this list? You obviously didn’t read the whole thing.